A plot of land is for sale in a village, located 3 km away from town Elin Pelin , 25 km from Sofia and, 6 km from Gorni Bogrov and Dolni Bogrov. Elin Pelin's region is one of the centers, where tradition and unique folklore are kept. Every year Shopski feast takes place in the town, which was started in 1970. The Municipality is a main transport junction and crossing point for the transport on both sides of the Balkan Range. The infrastructure in the region is excellent. International hunting tourism has been developed in Aramliets State Hunting Unit and Vitinya State Game Breeding Unit, Ognyanovo Dam Lake offers wonderful conditions for water and motor-water sports as well as fishing. The Municipality has a project at the stage of pre-feasibility study for the establishing of an Environmental Vacation Village near Ognyanovo Dam Lake. A modern golf course St. Sofia has been constructed on the land of Ravno Pole village. 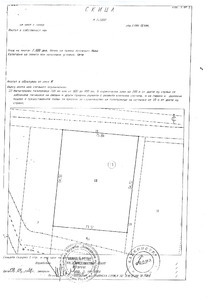 The plot's area is 5401 sq m and it is 5th category agricultural land.